I'm on Windows 7, 64 bit system, using 64 bit DAZ 4.5 Pro. Will try the new instructions. Failed to load script file! Hmm that is very strange. Confirm you installed to default location (My Library/Scrips/cridgit/PoseMaster) ? Could there be any file permission issues? 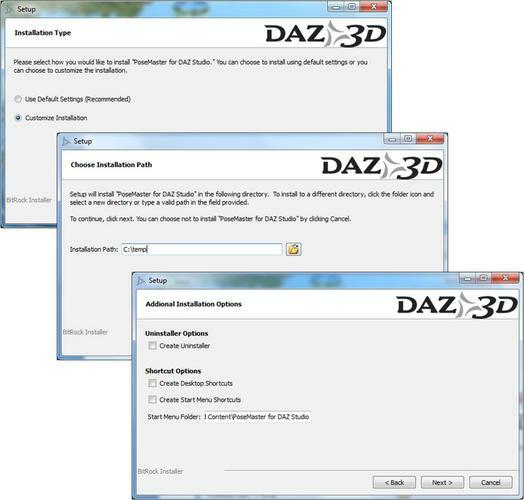 Have you shut down DAZ Studio (and confirmed it is shut down by checking the processes in the Task Manager) ? If you scan for new content, Studio will find the above file and put it in the Unassigned category. Run the file and it should show you a popup dialog and write the script name to the log file. I've done a bit of research into this error and it seems to be related to content being in the wrong place, so I can only think there must be a problem with Studio finding the script. Make sure you're launching the script from the Content Library reference and not the toolbar (just in case the script has moved). I suggest you manually remove PoseMaster from your system and try a reinstall with default options. 1. Delete the My Library/Scripts/cridgit folder. 2. 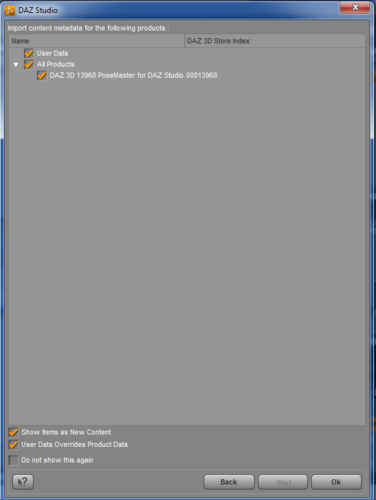 Go to Studio, open the Products list and right-click on PoseMaster for DAZ Studio then click Delete Installed Metadata. 3. Go to My Library/Runtime/Support and delete the three DAZ_3D_13968_PoseMaster_for_DAZ_Studio files (1 x DSA, 1 x DSX, 1 x JPG). 4. Reinstall PoseMaster version 1.5 to the default location (My Library). 5. When you start DAZ Studio it should reimport the PoseMaster metadata again. How do I do that second step? Are you talking about in the Windows/Start menu? Because I couldn't find any way to pull up Posemaster there. Or in C:/Programs/DAZ? Screenshot below showing how to delete metadata. It sounds like the uninstall/install has gone totally wonky. Try the manual uninstall steps I explained above (including deleting the metadata) and then a clean reinstall. From there we can take it step by step to figure out exactly where the problem is. I'm sorry you're having so much trouble with this. Assuming you can see the image, you want to go the Content Library tab, find Products (between Other Import Formats and Categories) then go to P and right-click on PoseMaster for DAZ Studio. Just follow the orange selection highlights in the screenshot. Used Posemaster to convert one of the M4 poses from Moonshines Diner Interior Poses to Genesis (the customer at the counter). DS4.5Pro render, prework and postwork in GIMP. Larger version in my deviantART gallery here. Hi Beth, thanks for sharing. That pose transferred pretty well - it has a nice natural look. I like the detail in the scene. All right. Found the Product>Posemaster - right clicked, deleted the metadata - along with all the other steps you spelled out. I'm still getting the same error message though. Also, when I try to do the fresh install of posemaster 1.5, I'm still getting a warning about 'recommend you remove the old version first to avoid conflicts' - so somehow it's not getting cleaned out by the deletion process. I do appreciate all the help and hope we can get this figured out. Let me know what you'd like me to try next once (and I understand the path forward may bequire a bit of trial and error) - so thanks again, and I will do my best to remain patient. Can you check this post http://www.daz3d.com/forums/discussion/9157/P45/#168542 and let me know if that's what you're seeing in Studio after installing the upgrade? Let's first make sure everything installed ok.
Ok - checked the other post. I only have 10 scripts, not 11, in my categories/default/utilities/scripts/posemaster/utility folder - so looks like the update to 1.5 isn't taking hold for some reason. Note, I also have a cridgit folder under categories/default/scripts/cridgit (with posemaster/utility and posemaster/test as subdirectories, none of which have any files in them. It sounds like we might be getting closer to the issue. If you have PoseAssetSerializer.dsb in Categories/Default/Unassigned/Scripts/Cridgit/Posemaster/Utility then at least the file is on your system, but it sounds like the metadata didn't get installed or has invalid references. What doesn't sound right is having a Cridgit folder under Categories/Default/Scripts/Cridgit. Does that mean the path is Categories/Default/Scripts/Cridgit/Cridgit? That's certainly not correct, and Categories/Default/Scripts/Cridgit/PoseMaster should have 6 scripts in it, Categories/Default/Scripts/Cridgit/PoseMaster/Test should have 1 script, and Categories/Default/Scripts/Cridgit/PoseMaster/Utility should have the 11 scripts in it. It might be useful for you to check the file system to see where those scripts have ended up (what is in the My Library/Scripts/cridgit/PoseMaster folder on your hard drive?). I'm almost sure the install must be going into the wrong location, which invalidates the metadata references so they won't show up in Studio. If you try a PoseMaster reinstall, please give me a screenshot of the screen where you specify the install location? The scripts can't simply be missing - they have to be going somewhere. 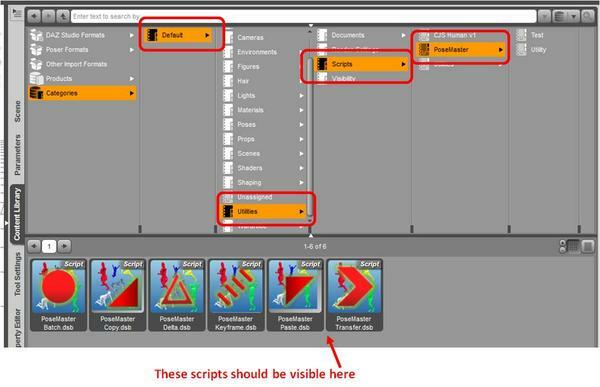 If you can see the scripts in the PoseMaster product view, try running PoseMaster copy from there by double-clicking it. If it works, then we know the problem is in your Content Library references. What doesn't sound right is having a Cridgit folder under Categories/Default/Scripts/Cridgit. Does that mean the path is Categories/Default/Scripts/Cridgit/Cridgit? That's certainly not correct, and Categories/Default/Scripts/Cridgit/PoseMaster should have 6 scripts in it, Categories/Default/Scripts/Cridgit/PoseMaster/Test should have 1 script, and Categories/Default/Scripts/Cridgit/PoseMaster/Utility should have the 11 scripts in it. It might be useful for you to check the file system to see where those scripts have ended up (what is in the My Library/Scripts/cridgit/PoseMaster folder on your hard drive?). Checked on my hard drive - and everything appears to be installed as you described it, with the right amount of scripts in each folder. If you can see the scripts in the PoseMaster product view, try running PoseMaster copy from there by double-clicking it. If it works, then we know the problem is in your Content Library references. Tried double clicking this. Still gives me the same error, with script failed to load. I'm stumped. You should file a bug report (bugs.daz3d.com) because it sounds like you might need tech support for this issue. I haven't the foggiest what could be causing the problem. If the correct files are in the correct location (I checked the sizes/timestamps in your screenshot) and DAZ Studio can see them, then there must be something else wrong for Studio not to be able to run them. Can you try running any other DSB scripts (non-PoseMaster ones)? You should also try to start Studio from a clean log then check the log after startup for any errors. 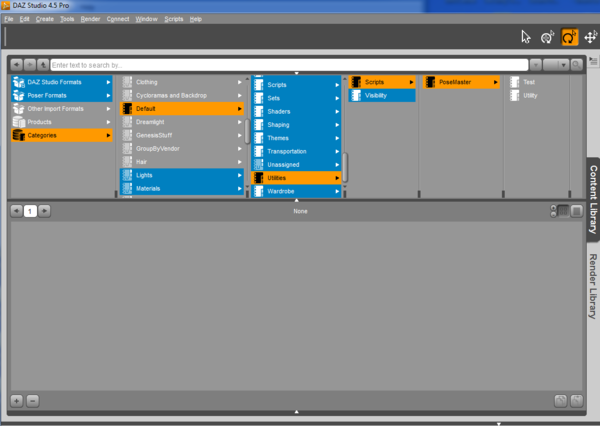 Maybe one of the Studio files got damaged or uninstalled by mistake or isn't loading properly. As a matter of interest, did you try reinstalling PoseMaster version 1.4? Maybe that works and its the 1.5 upgrade that doesn't work on your system. I re-checked the upgrade EXE this afternoon and it is working correctly on my system and other people's systems. On a related note, I've provided a freebie for MilHorse <> Charger pose transfers, so once its working at least you'll be able to play with that :-) See the People Pack thread for the link. Can you confirm the build number of you DAZ Studio 4.5? Go to Help / About. And please give me a screenshot of your PoseMaster product view with the 17 scripts. I would just like to check if there is anything obvious wrong in DAZ Studio. The script files themselves look fine. Sorry - I've been out all day - just getting to the computer now. 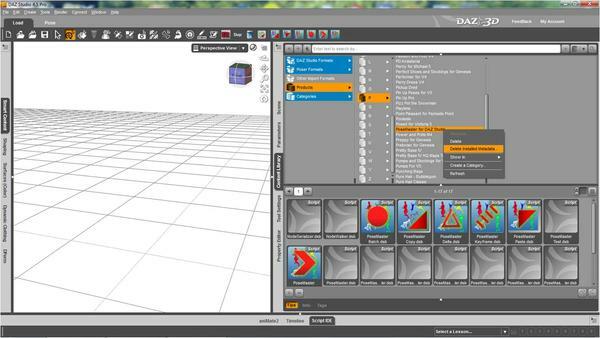 Currently using DAZ Studio Pro version 4.5.0.137 64 bit. I also have the 32 bit version of DAZ 4.5.0.114 installed on my computer (which I've used a few times recently since it included lip synch ability) and DAZ 3.1.2.24 Advanced Edition 32 bit. I don't know if those extra versions could lead to any problems with clearing out old installations of Posemaster. 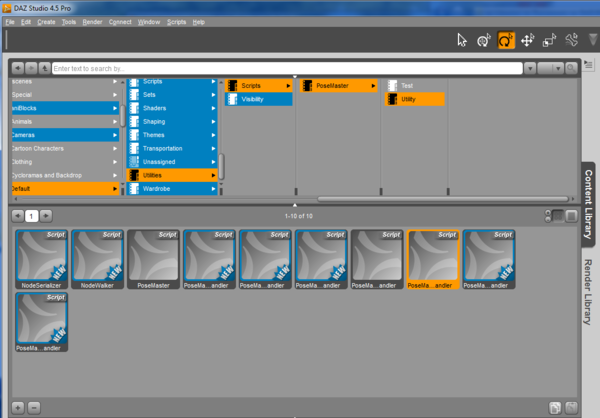 In terms of running other .dsb scripts, I just tried one (SpawnMorph or Light Panel) which didn't work but I am able to run the Poser Format Exporter scripts (both the .dsb and .dse versions). 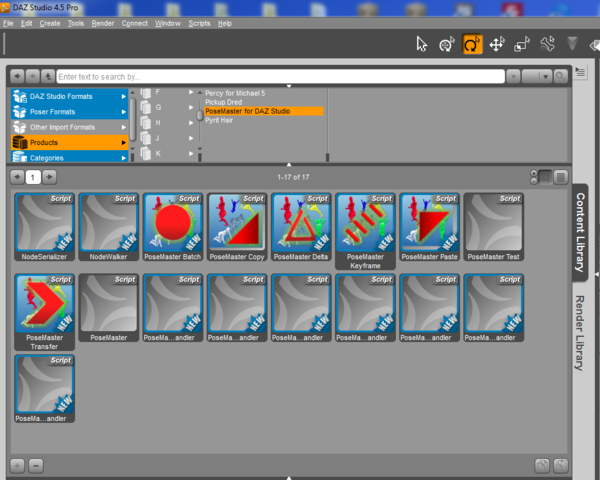 Note - the SpawnMorph and Light Panel .dsb's gave me different error messages than I got with posemaster - these had an error in one line number and a failure to execute. Okay - here's where things stand now. I went back through the whole deletion process you described a few posts back. Ran the uninstall scripts for Posemaster and Posemaster metadata. I was then able to reinstall Posemaster 1.4. I don't see it showing up in my Default>Unassigned>Scripts folder after scanning directories, but does show up in product area and I can now run the test script - and says All tests completed; 1922 of 1974 test cases passed in 4344ms. There are once again 17 scripts under PoseMaster for Daz Studio in the Products/P directory. Advice on what to try from here? The latest version is 4.5.1.6, so you might want to try updating Studio at some stage, but PoseMaster's supposed to work from DS3 and up so let's leave that step be for now. I know DS4.5 and DS4 couldn't be installed together, but as far as I know DS4.5 and DS3 is ok. I don't want to rule anything out at this stage, but again let's leave this option be for now. That all looks ok for PoseMaster 1.4. Version 1.5 introduced a new script (Utility/PoseAssetSerializer) which isn't showing but I've just realized it might be missing from the metadata. However, that shouldn't affect the functioning of the scripts. I don't see it showing up in my Default>Unassigned>Scripts folder after scanning directories, but does show up in product area and I can now run the test script - and says All tests completed; 1922 of 1974 test cases passed in 4344ms. There are once again 17 scripts under PoseMaster for Daz Studio in the Products/P directory. Good to hear you could run other scripts and that 1.4 is working as expected. That gives us a clean base to start from. The installer also installs metadata, so you wouldn't find the scripts in Unassigned. They should be under Utilities/Scripts/PoseMaster (or possibly Scripts/PoseMaster). Could you please confirm that? However, again this shouldn't affect the functioning of the scripts. See next post for next steps. Now let's try the following. 1. Shut down Studio then go to My Library/Scripts and make a backup copy of the Cridgit folder. We'll use this to restore version 1.4 if needed. 2. Run the version 1.5 installer and do a custom installation to a temp folder (I used C:\TEMP) - see screenshot #1 below. You don't need to create an uninstaller etc. and if the installer asks to uninstall the previous version, simply say "no". 3. Go to the temp folder and verify it contains 3 subfolders: ReadMe's, Support and Scripts - see screenshot #2 below. Validate the ReadMe's and Support folders contain the files shown below. 4. 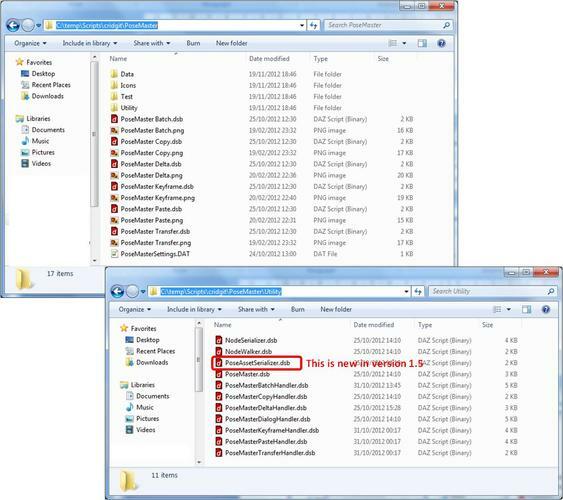 Still in the temp folder, verify the Scripts/cridgit/PoseMaster and Scripts/cridgit/PoseMaster/Utility folders contain the files shown in screenshot #3 below. Make sure you have the new Utility/PoseAssetSerializer.dsb. 5. If that all checks out then the installation is correct. Now we'll move the installed files into the proper location. Go to the temp folder again and select the 3 subfolders: ReadMe's, Support and Scripts. Move these to your Documents/DAZ 3D/Studio/My Library folder. Say yes when Windows asks if you want to overwrite files and folders. 6. Now restart Studio. It will ask if you want to import metadata for PoseMaster and you can say yes. Confirm you can find the PoseMaster scripts in the content library categories: Default/Scripts/PoseMaster as shown in screenshot #5 below. 7. Now you should be able to run PoseMaster Copy by double-clicking it. With nothing selected, it'll give you an error popup saying "Nothing selected" which means its working. Please let me know if you find anything different at any step above and we'll go from there. I went through all the steps you outlined. All of the file names, sizes, and timestamps look correct. If I go to default/utilities/scripts/posemaster - then the 6 scripts show up - Batch, Copy, Delta, Keyframe, Paste, and Transfer -, but they all give me Failed to load script file errors, as does the Test script under default/utilities/scripts/posemaster/test. 1) I didn't go through and remove Posemaster 1.4 this time. Should I remove it with the steps you described in an earlier post and then retry this whole process? 2) When you have DAZ import the metadata, at the bottom of the screen, there's a checkbox that's ticked by default which says to let USER DATA override PRODUCT's DATA (image below) - should I uncheck that and try it again? 3) When DAZ starts up, it asks if I want to include that C:/temp file where we temporarily installed Posemaster1.5. I said no because I'd brought a copy of those folders into MyLibrary as instructed (I actually copied instead of moving) - any problem there? 4) My Posemaster 1.4 scripts (sitting in BACKUPCOPY of Posemaster) remain functional - don't know if having them present could cause some conflict. Let me know what to try next. This is not a problem. You're actually referring to the "categories" in Studio, not "directories" or "folders" which are on your hard drive. The PoseMaster scripts are in the correct location on your hard drive, and they seem to be in the Default/Utilities/Scripts/PoseMaster category (from your screenshot the Default/Utilities/Scripts/PoseMaster/Utility category is correct). If you want to know where the references are in the content library categories, just go back to the PoseMaster product view then right-click any of the scripts and select Categorize. The category/ies it is in will be checked and you can put it anywhere you like by checking the relevant category. You can find out where it is by following the white-shaded category names. 2) You're right that that should override the imported metadata with your existing settings, but I haven't found this to be working yet (I've already filed a bug report). 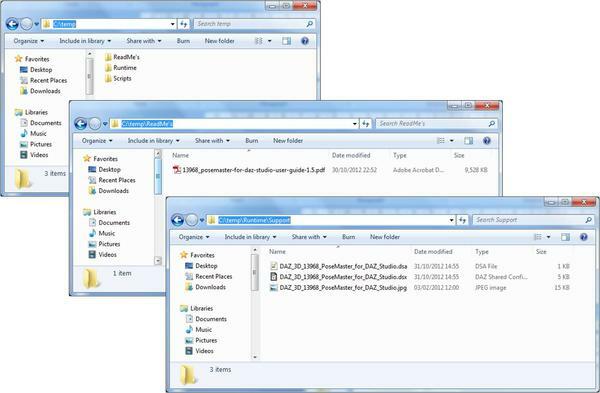 3) No problem, but I've never seen Studio ask to include another folder yet. Did it only happen once or is it still happening? I'd like to see a screenshot of that if it comes up again. 4) No problem at all. 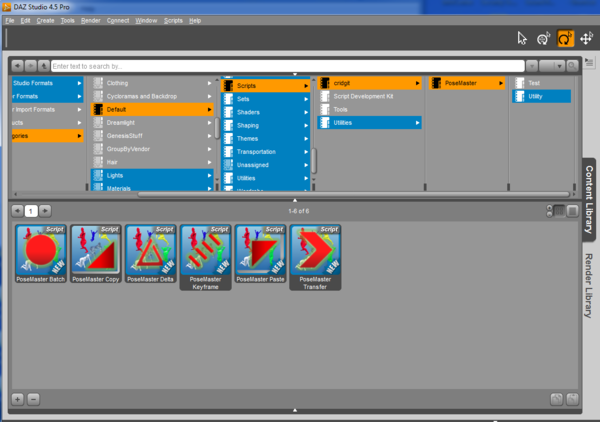 PoseMaster runs purely out of the folder the scripts are located in, so you could move them anywhere as long as you move the Utility subfolder as well. No need to change anything here. 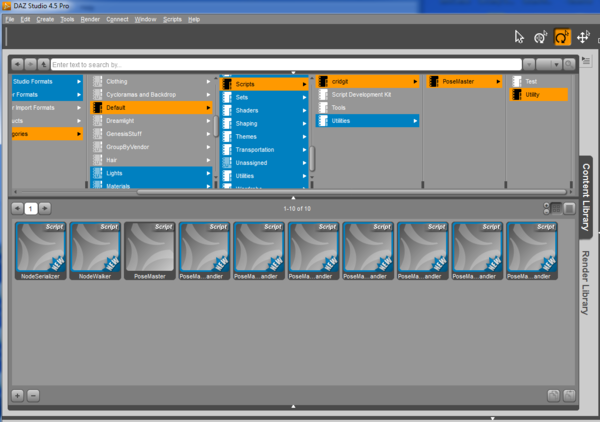 So now you have the correct files in the correct location and Studio can see them. You have the same PoseMaster DSB files as everybody else, and yet other DSB files are working on your system. If that doesn't work, check your content directories. I found this thread (http://www.daz3d.com/forums/discussion/5803/) in which installing My Library to a non-C drive caused Failed to Load Script File errors. What drive is your My Library on and can you confirm you have it under both DAZ Studio Formats and Poser Formats in your Content Directory Manager options (as referred to by fixmypcmike). Lastly, I noticed in your screenshot the scripts have back-up icons. Is there any chance they're locked by a backup or indexing process? You could check by renaming one of them. If it can be renamed, try running it and see if you get a different error. Otherwise copy PoseMasterCopy.DSB to Scripts/cridgit/Test.DSB. Try running that and see if you get a different error. Hey Cridgit - good news, finally! I think everything is in working order now. Updating to the newer version of DAZ seems to have been the critical element since I'd tried testing everything else along the way (I think - I guess it's possible I lost track of some of our attempts along the way) - which probably means DAZ will be eager to reimburse both of us for all that lost time in trying to troubleshoot this. I really do appreciate your sticking with me, though, because in my experience, if it gets to DAZ tech support on anything specific or technical like this, the answer just about always has to wait for days/weeks/ or months until a helpful user or PA figures out how to fix or work around the problem and takes the time and effort to share it with the rest of the community. And those backup icons are from Carbonite which I use to backup my computer externally - I need to go back through my settings and make sure I'm only backing up the directories I want. Nothing was locked, however. I went in and made a copy of a script without a problem, and was able to rename the original script as well. When I run the test script now, it gives me 1944 of 1944 test cases passed in 5522ms. Thanks again for all the help in getting this working - and for the Millenium Horse to Charger script which will keep me sated till you have time to finish your animal pack! I have one other question about Posemaster, which doesn't relate to any problem with the program, but just a question about the best way to approach a problem I'm having. I do a lot of animations (as opposed to stills), and I'd like to work with Genesis (as opposed to be generation 3 or 4 models) for a number of reasons that don't specifically matter to my question at hand. In order to take advantage of all my accumulated poses for generation 3 and 4 models, PoseMaster is great. And if I do an M3 pose to Genesis, and then apply the M3 Shape to Genesis, things are just about spot on. If I don't apply the M3 shape, however, Genesis's hand may intersect the knee or chest depending on the pose, and in animation, where multiple animated clips are being run together, it can become pretty time consuming to go through and correct all those errors, and then try to keep things smooth. So my problem comes because I want to be able to apply a variety of clips (converted from m3, v3, m4, v4 and so on to Genesis) - and I obviously can't have all the different Generation 3 and 4 shapes applied at the same time. 1) Even if I don't apply the M3 shape to genesis, will poses transferred by PoseMaster from M3 to Genesis still be closer to the original pose than I'd get just by applying the original pz2 with Genesis selected? 2) Do any workarounds come to mind in the case where I have a fixed Genesis character and want to apply a variety of poses that have been converted via Posemaster to work with genesis? 3) Assuming Posemaster can't help with this at the moment (or that it already handles this issue as best it can), is there any script based way you could program as an add on that would automatically prevent intersecting geometries (like a hand in the chest or knee) by adjusting the rotation on a limb until the body parts were clear of each other? Thanks again for all the help. The kind of technical support you offered (particularly in combination with the utility of your products) has certainly earned you a long term customer, and I'm sure any one who opens this thread will see how seriously you take the job of supporting your customers. I think everything is in working order now. Updating to the newer version of DAZ seems to have been the critical element. Yay! Thanks for your patience and feedback :-) although I'm really sorry it took this long to nail down. I'll make a separate post to DAZ to understand the rationale. To me it makes absolutely no sense at all that I need to save my scripts with the oldest version of Studio so that all customers can use them. And if I do an M3 pose to Genesis, and then apply the M3 Shape to Genesis, things are just about spot on. If I don't apply the M3 shape, however, Genesis's hand may intersect the knee or chest depending on the pose, and in animation, where multiple animated clips are being run together, it can become pretty time consuming to go through and correct all those errors, and then try to keep things smooth. PoseMaster does the best it can with the transfer, which usually is much better than simply applying the original pose, although not always 100%. The quality of an original pose transferred to a different figure varies: sometimes it works fine, sometimes the hands and feet are off, sometimes it hardly transfers at all (due to skeleton differences) and sometimes it sort of works but due to mesh/rigging differences the limbs are off. If you have say a M3 pose where his hands are holding his head, or a V3 pose with her hands on her hips, then transferring that pose as is to Genesis without the M3/V3 shape applied could cause intersection because M3 and V3's mesh and rigging are different. Using scale during transfer alleviates the problem a little, because it matches limbs lengths, but it still won't work perfectly on all poses. I wish there was a script-based way to fix this and I've tried using DS4's collision but no luck yet. Solving this problem would be useful for posing and animation in general (not just for PoseMaster) and I hope will one day be supported natively in Studio. There is also no "generic" offset pose for this because the intersections are highly dependent on the rotations of all joints in the skeleton. So at the moment, unfortunately there is no way I am aware of to take that next step with PoseMaster (it would require firstly detecting mesh intersection and secondly using IK to move limb endpoints). Another possible strategy is to define the space around the head/torso in terms of all valid rotational permutations for all arm joints, but that would only work for the zero pose and would probably be very slow (a combinatorial solution). 1. Go to the first keyframe with the intersection and copy that pose to Default. 2. Correct the pose by hand so that the hands don't intersect the head. 3. Launch PoseMaster Delta and leave Default as the "from" and "to" pose. You've now created a snapshot of the delta (the difference) between the intersecting pose and the corrected pose. 4. Go to the subsequent keyframes and Paste the Default (delta pose) to Genesis with Rotation, Recursive and Relative checked. This applies the first keyframe's delta to the subsequent keyframes. The above is quicker than correcting each keyframe by hand, but assumes the degree of intersection is the same in all the keyframe poses. Its the only way to do this for animated pose transfers in PoseMaster today. Yes that's normal. Anything that hasn't been specifically placed in a category (by metadata or by you) shows up in Unassigned and you organize it from there. That's actually extremely useful for finding new content - consider it your "inbox". Similarly, when content is installed with metadata you can choose to highlight it as new content, which means you can easily find it and reorganize if you wish. Just make sure you right-click one of the highlighted categories when you're done and select Mark All Content as Seen. Then you'll easily be able to find new content after installing. I use that + the Unassigned to easily recategorize all my new content so I know exactly where it is. Thanks! 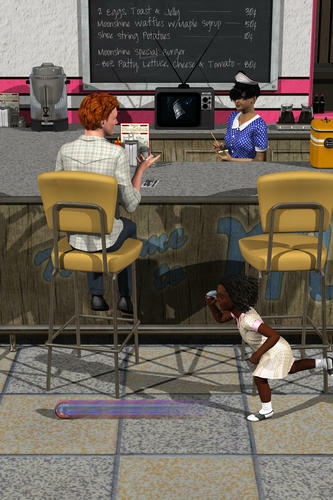 Did it again in my latest PlatClub Inspirations submission -- The woman is using a pose originally for M4 from Moonshines Diner Interior Poses, converted to Genesis with Posemaster. Wow, I love the ivy and the lighting on this one. Of course the pose rocks as well ;-) Is that ivy part of the set or from a different product?